Cantilever Racking is specially designed to store long or varying length items, such as metal beams, pipes, mouldings, wooden boards, metal and plastic sheets among other materials. The system basically consists of columns with a vertical beam and one or two horizontal beams at the base to provide stability. A series of arms are attached on which the load is placed. Loads may be handled manually when they are lightweight, or by using lift trucks or other appropriate lifting systems when heavy items are involved. 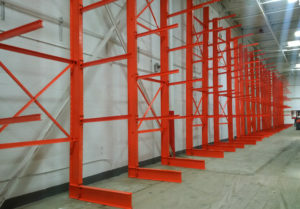 Cantilever racking can come in single and double sided applications; a warehouse is configured with a combination of single sided cantilever, normally placed against the walls with access from one side only, and double sided cantilever which can be accessed from both sides. Light duty cantilever racking is designed for storing product manually. All components are easily assembled and consist of vertical and horizontal beams and arms constructed to handle light weight loads. Medium duty cantilever systems are constructed of the same components of light duty cantilever. Medium weight loads are stored and retrieved using fork lifts. Heavy duty cantilever consists of heavy duty beams and arms that is easily assembled, with interlocking components, that provide system flexibility for adapting to varying storage requirements. Product is handled with lift trucks, mobile cranes and stackers. Single Sided or Double Sided cantilever racking? Do you want arms to be straight or Inclined upwards (flat or tubular product)? At the end of each arm, do you require a stop (pin) to prevent loads rolling off?